Taller in length than the Washington Monument, wider at its center than a three-lane highway, the 18,750-ton Trident nuclear submarine is the most complex war machine the United States Navy has ever produced: a $1.8 billion marvel crammed with more modern military technology than any other vessel in the world. Deep beneath the ocean it can sail for months, undetectable to enemies.Now for the first time, veteran "Time magazine correspondent Douglas C. Waller -- granted more access to one of these awesome submarines than any journalist before -- penetrates the silent, secret world of nuclear subs, taking you on a tension-packed, three-month patrol under the Atlantic Ocean inside the U.S.S. "Nebraska, fondly nicknamed Big Red. 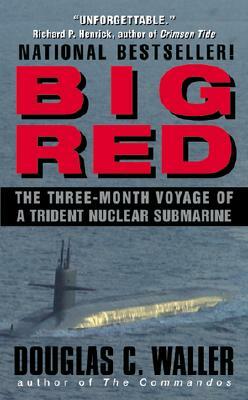 In chilling detail, witnessed through the eyes of the men on board and told in their own words, Big Red reveals the top-secret procedures for starting World War III, including secret codes, elaborate fail-safe mechanisms, and highly classified battle tactics for nuclear combat. It's a ride you'll never forget.